The desire to capture the likeness of an individual in three dimensions has existed since antiquity. It is a potent sculptural form that speaks directly to us across history and between cultures. Commissioning and sitting for a portrait sculpture offers the opportunity to be part of this ancient tradition — as well as the chance to participate in the creation of a piece of contemporary sculpture. A successful portrait sculpture will embody the unique presence of the sitter as well as the singular hand of the artist — balancing likeness, character and abstract qualities in reciprocal tension. "It was a pleasure to have Brook working on the portraits in our home and we miss the weekly meetings. Not only did we gain three wonderful life-like sculptures of our children, we gained an amazing insight into the process of portrait sculpture – and also a friend." Ideally a portrait sculpture is created from life. During the first sitting I discuss options for the form and character of the piece with the sitter — or we may simply agree to get started and see what happens. There's no need to sit completely still or be silent – chatting is fine. I usually take a set of still photos, a video and some measurements at the first sitting. 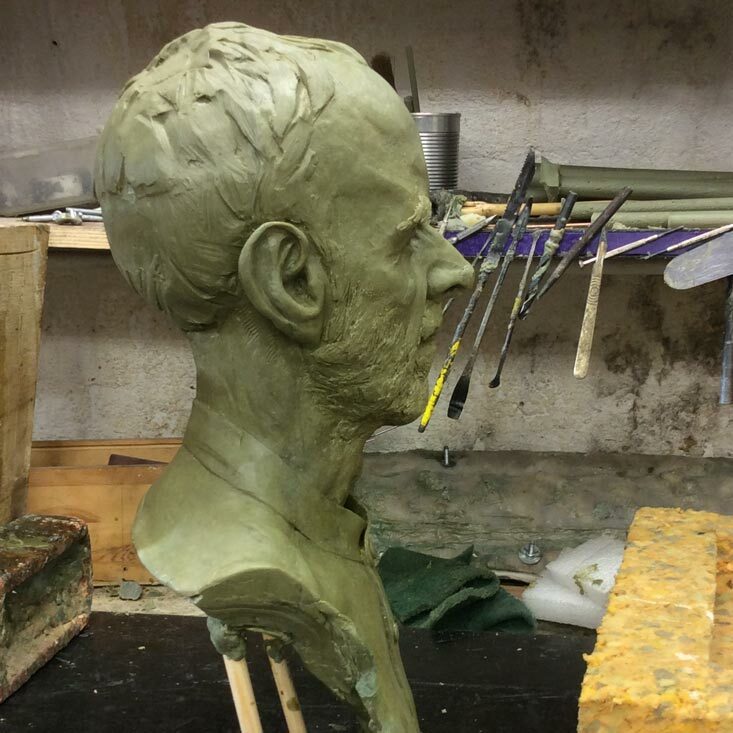 The portrait is modelled in clay and will gradually evolve over the course of about six sittings. But if time constraints or other factors make sittings difficult, it's possible to work partly or even exclusively from photographs. I'm happy to create posthumous portraits from photographs, as well as historical, fictional or symbolic characters from existing images or from imagination. Once the clay original is complete, the piece may be cast in plaster, Jesmonite or bronze. If you'd like to take part in this compelling art form please contact me to discuss options. 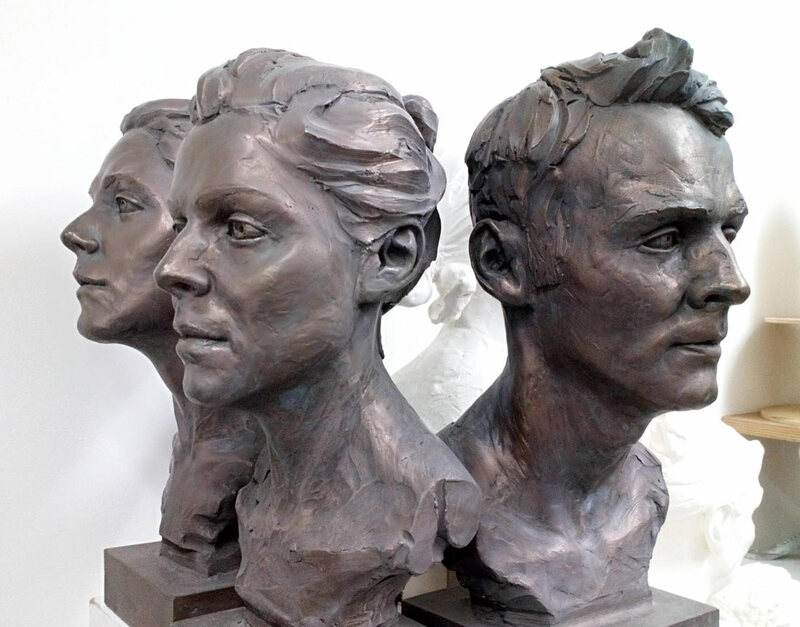 When you commission a portrait sculpture, whether for yourself or as a gift, you will not only be gaining a piece of contemporary art, you will be embarking on a fascinating journey that begins in the sculptor’s studio and travels back in time to methods and processes that originated in pre-history. Your portrait sculpture will be modeled from life and/or photographs in clay initially, either in my studio or at your home, if that's more convenient for you. When you are happy with the clay version, I will take the finished piece to the foundry for a silicone mould to be made. This enables the original to be faithfully replicated in a variety of materials and any number of times. 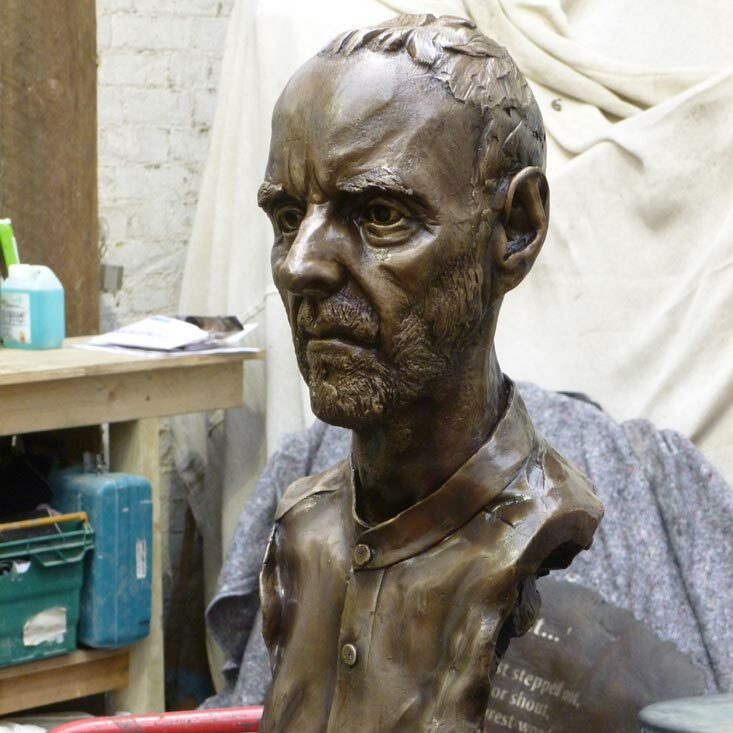 If the portrait is to be cast in bronze, the foundry will make a wax version which I will check before giving the go-ahead to proceed with pouring the bronze. 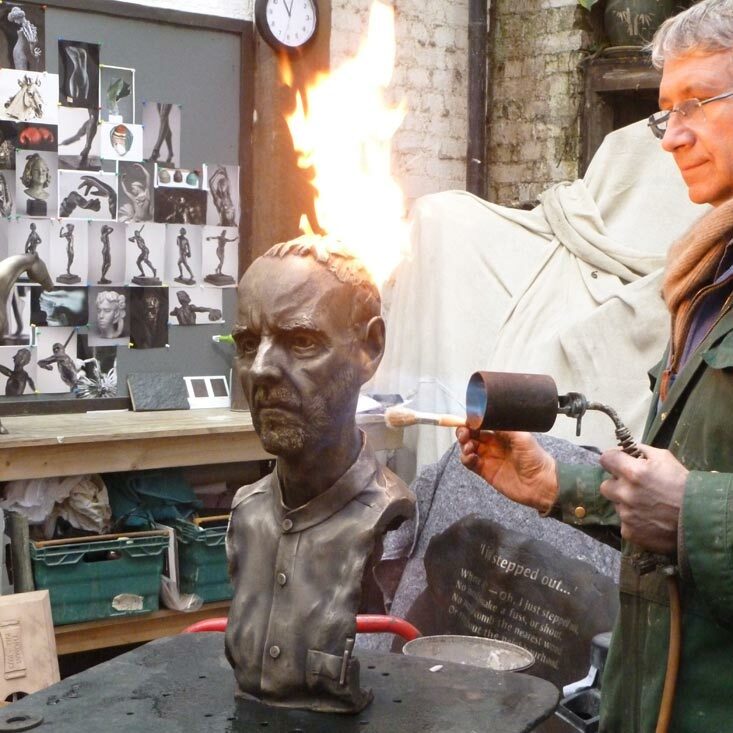 A further check takes place once the bronze version has been cast, cleaned and 'fettled'. The next step is 'patination', which involves treating the raw bronze with different chemicals to achieve the desired surface finish. I will be present during the whole process to ensure the finished result meets my own and my clients’ expectations. A final light wax coating fixes the finish and the piece is ready to be mounted on a stone or wooden base. The casting process is highly skilled and labour intensive – and typically takes about 8-12 weeks. The near alchemy involved in the transformation of clay to bronze and the sense of connection with ancient traditions is an exciting and fascinating process. Browse the portrait and process sections of Works to learn more.